I am all about closet costumes, aka, costumes that could be sourced straight from your closet. But I like mine with a little twist – closet expansion costumes – ones that require the purchase of one piece that can be enjoyed year round – and I’m a sucker for pretty dresses. 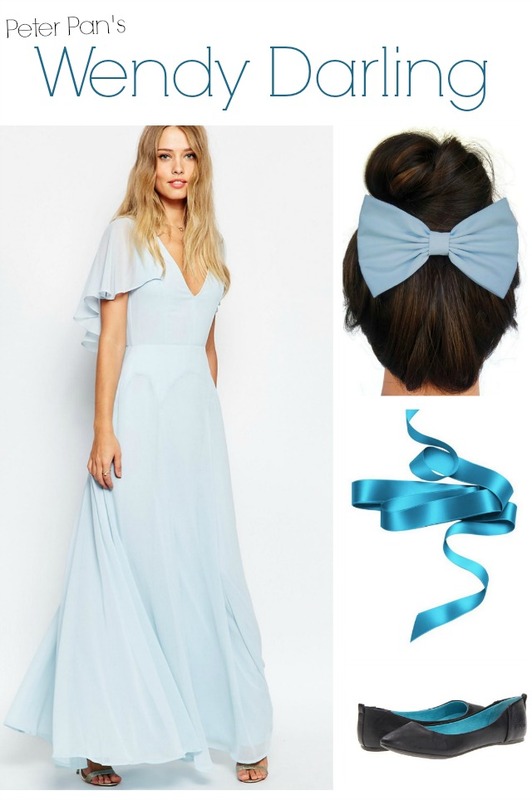 When I saw this blue ASOS dress, I knew it would be perfect for a Wendy Darling costume as well as weddings and events next summer. 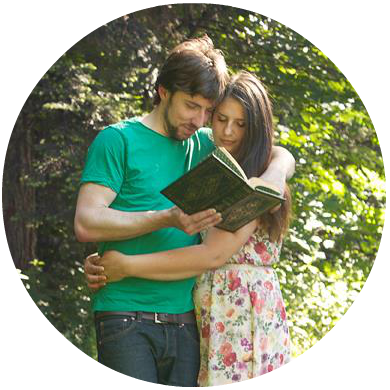 Now the only thing left to do is talk Billy into a Peter Pan or Captain Hook costume…..
Pst. Check out my vintage witch costume from last year! Here in Seattle, Nordstrom’s two huge yearly sales are pretty much holidays. Shoppers create game plans, reading the catalog from cover to cover, figuring out their wish list and purchase priorities. The beautiful thing – since Nordstrom offers free shipping and free returns (LOVE this), you can avoid the crowds and shop with ease. Check out my top picks – the sale goes ’til May 31, 2015, so shop while you can!!! We’ve had an unusually delightful end of winter. The cherry blossoms are already blooming and the sun shining. Out come the dresses and away go the sweaters and heavy jackets. The countdown to spring has begun! I’m tempted to say spring is my favorite, but truth be told, the changing of seasons is my favorite. With that. Here is an outfit that I crave to throw on and run to the nearest farmers market. I must admit that I was slightly influenced by the new Cinderella movie. Guilty. But more so than that, my ballerina roots are always a strong influence. I hope you are celebrating the changing of seasons in your small ways. Necklace: Pair with anything, any season, but the flowers make is especially appropriate for spring. Sunglasses: I’ve had few pairs of ‘expensive’ sunglasses, and I have no idea where they ended up. Cheap, stylish, and in some ways, loseable sunglasses are my go-to. These are just a few dollars.Market Bag: On the pricier end, but it is lovely, durable and shows Seattle spirit. A worthy splurge. Shoes: These really put the ‘ballet’ into ballet flat. Shirt: A graphic tee pairs with a tulle skirt perfectly. This tee speaks to the indulgent nature of weekends. Essie: One can never go wrong with a pink mani, especially in spring. Skirt: Can we talk about this skirt? 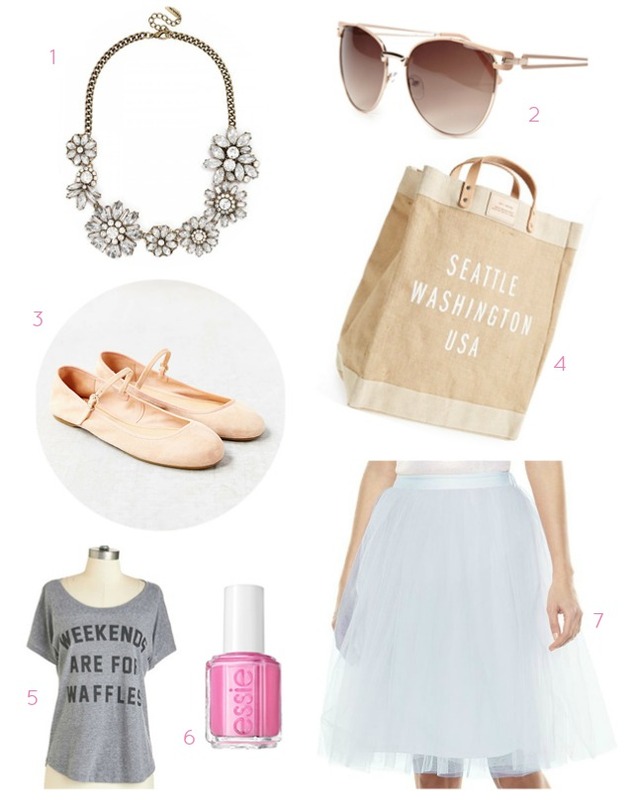 I would be happy if a tulle skirt was the last thing I ever wore. It comes in a couple colors and I want to buy them all.